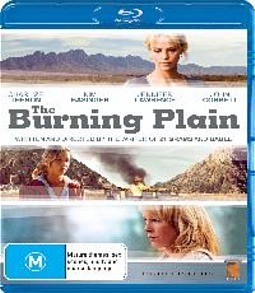 The Burning Plain tells the stories many characters, but most notably of two separate women. Sylvia (Charlize Theron), a troubled, promiscuous woman, living in Portland, who has episodes of self-harm and Gina (Kim Basinger), a wife, mother and family woman, living in New Mexico that is carrying on an affair with married man; Nick (Joaquim de Almeida). The stories of these woman continue on until we find out that they are both connected in a very deep and personal way. The Burning Plain is a fractured tale, told in a non-linear fashion, that is written by and is the directorial debut of Guillermo Arriaga, the screenwriter of similarly told tales; Amores Perros, 21 and Babel. Guillermo manages an impressive debut, able to guide his talented cast to deliver some great performances. Theron, showing her acting chops again as Sylvia. A woman that is struggling with her past, every day, holding onto a devastating secret, struggling with the guilt that comes with the knowledge of the horrible truth behind her actions and the pain it causes not only her loved ones, but her own self as well. Basinger also impresses with her solid acting as Gina, a woman who is yearning for more love and appreciation in her life, that ultimately leads to a terrible conclusion for all involved. The Director; Guillermo Arriaga reflects the different moods and settings to each woman very well on film, with Sylvia’s moody and weighted tale in Portland, told by the ocean is depicted in cold blues and wet locations. Gina’s story is told in the deserts of New Mexico, which is very dry and golden in tone, which compliments the Blu-ray transfer very well. Also showing vivid colours, deep blacks and impressive detail. This release of The Burning Plain comes with out any extras to speak of, which is very disappointing for any Blu-ray release. The Burning Plain is a well acted, emotional tale, filled with sadness, guilt, longing and despair, but also love and in the end, hope for the future..